One of Yorkshire’s best new synth bands last year was Berlyn Trilogy headed by Dorian Cramm. He opted to leave that project behind and has now begun a new one under the name of Promenade Cinema where he is joined by Blurred Girl, who as you may recall joined us for a euro cheese special at the end of 2013 and was briefly a part of Jan Doyle Band. To us it sounds like the perfect evolution from the work he did within Berlyn Trilogy, keeping a sonic theme but moving on into even greater more expressive territory. Here’s a Chemical Haunting, it will delight your ears muchly. Before I continue, you must agree that the title got you intrigued, right? Hypernoise 30xx mode! Read on, and all will be revealed. During a recent conversation with a certain Mr Williams, it was suggested to me that I write on here about my synthesizers. What I didn’t want to do was write yet another synth review on each that I own, as the t’interweb is awash with such articles. So I wanted to either reminisce about buying synths, or talk about their aesthetics, or how they sit in my setup; give a user’s perspective rather than just a rundown of their specs. Designed at Bleep Labs in Austin, Texas early 2010, the Nebulophone has been described as a “Stylophone on crack.” Indeed, a stylus is used to play, but sound-wise, it leaves the Stylophone dead in the water. It’s an Arduino (Even I don’t know that one. I presume it’s this – Ed) based synth that is the size of a credit card, yet it sounds massive. It comes in kit form and costs around £50. 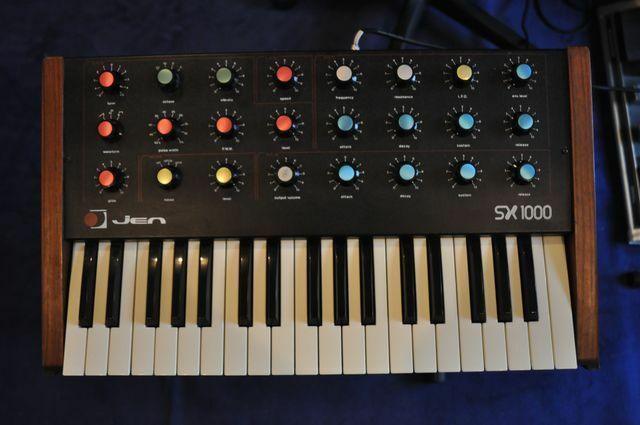 For something so cheap, and so small, its features are impressive; 8 waveforms, 6 arpeggio modes, adjustable portamento, adjustable decay (How long a sound takes to return to its initial level – Synth Explaining Ed), a light-controlled analog low-pass filter (LPF) (used to cut higher frequencies from sounds. It’s how you get those weeeownnng sounds; reducing it to zero – Synth Explaining Ed). with 5 adjustable LFO (Low Frequency Oscillator – used primarily for making cyclic modifications on things, like say vibrato or making the brightness of a sound vary up and down over time – Synth explaining Ed) modes, perfect tuning over 6 octaves, and keyboard mapping (To make it play notes when you press them on a keyboard – Synth Explaining Ed). What’s more, you’re able to program sequences of up to 32 steps, control the arpeggios, sequence and LFO via infra-red (from similar devices) and it’s also possible to sync with the Korg Monotribe and the Korg Volcas (which are recent ‘pocket’ sized synthesisers – Synth Explaining Ed). Oh, and then of course there is hypernoise 30xx mode, which adds distortion and bit-crushing effects. Admittedly, its not the easiest of ‘keyboards’ to play, being so small and played with a stylus, but this does not make it any less usable. I’ve had mine a couple of months now, and have had it synced to the Volcas, with some very impressive and usable results. I’ve also had it fed in to the MoPho and had the Neb’s light controlled LPF modulated with the Curtis filter (A type of Analogue Synth Filter Chip made by Curtis Electronics that became abundant in the early 80s. Found in such as the SH-101 among many many more. More info here if here if you’re interested – Synth Explaining Ed). Again, some very interesting results. The Nebulophone may not be to everyone’s taste; you’re not going to get warm pads, or dual oscillator fatness (unless you sync with another), but for the money it’s a very welcome addition, certainly to my studio. At a time when I’m composing for my “Analog Punk” album, this beast has certainly paid for its keep; it looks the part and sounds fantastic. Think Atari Punk Console with far more scope. Search “Nebulophone” at YouTube and soundcloud> for more examples (or by clicking the links I’ve now added – Ed). I tuned in to D.E.F. radio earlier this evening to show my support for the new Meter Bridge album release, Slow Motion (first CD I’ve bought for about 5 years!) – get your copy here. That’s all for this inaugural post, thanks for reading! Microchip Junky’s views are his own and should not be considered indicative of the views of Doncaster Electronic Foundation. Unless they are really good views in which case they are entirely due to us.